Can you please offer help for the PRTG setup wizard Welcome to PRTG Network Monitor screen? Which edition is the right one for me? What's the difference between the editions of PRTG? Choose which edition of the software you would like to install. There are three options. Use PRTG for free without a time limit. Monitoring is limited to 10 sensors and a minimum scanning interval of one minute. No registration is needed to use PRTG as freeware! Test PRTG for 30 days with unlimited access to the software. You need to register at Paessler to obtain a trial key. 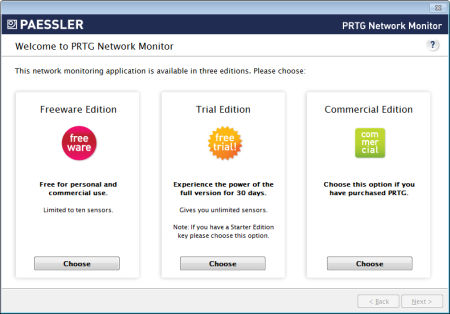 After the trial period, PRTG will automatically change to a freeware edition. Note: If you have received a special Starter Edition key for extended freeware monitoring with 20 sensors, please choose this option. Buy a license now or enter a license key that you have already purchased. This option is only available if you have downloaded the commercial installer. You cannot use a commercial key with the freeware- or trial installer. In order to download the commercial installer, please log in to your Paessler customer account. Enter a license key and monitor your network according to the PRTG license you have chosen.